You are here: Home / Outdoor Gear / Internal Frame for Wall Tent; How many Rafters? When we bought our wall tent, we also bought an angle kit for an internal frame. To save money on shipping, I bought 1 inch EMT tubing at the local building supply and cut the poles myself. The Angle kit consists of 3 and 4-way connectors that are welded from 1¼ inch (inside) galvanized steel tubing that hold the 1 inch (inside) EMT tube frame together. I was told to plan for 3% shrinkage, so I cut the tubing accordingly, but after four years, our tent has shrunk only about 1%, so the tent hangs very loose on the frame. Roof Section of internal wall tent frame. Includes ridge poles, side supports, 3-way and 4-way angles for connections. Legs have not yet been attached. If you don’t plan for shrinkage, the tent may not fit over the frame and you would have to re-cut poles before you could set the tent up. Now, I wish I had planned on 1% shrinkage instead of 3%. It’s not a big deal to cut another inch of each poles after a couple of years if necessary. How Many Rafters Does your Wall Tent Need? The first consideration for your internal frame of your wall tent, is how many rafters do you want or need? Our 14 foot tent has four rafters, making the spacing between rafters four feet eight inch spacing between rafters. For a 14 foot long tent, four rafters is marginal for structural support. Three rafters (7 foot spacing) are probably too weak to support the tent in all but the kindest/gentlest conditions like setting up in the back yard for a slumber party. If the tent will be left for days at a time where snow could build up, it would collapse with four rafters. So reducing the number of rafters reduces the cost and the weight, but in most cases, anyone using the internal frame isn’t planning to be far from the truck. Most people packing a wall tent by horse or 4-wheeler leave the internal frame at home. While more rafters increases the cost and the weight, it also increases the amount of snow the tent can support. Table 1 shows the spacing in inches between rafters (pre- shrunk) for 12, 14, 16, 20 and 24 foot tents with various numbers of rafters. Very few people will need more than 7-10 rafters, but I can envision setting up a large wall tent in a semi-permanent situation like a summer camp or scout camp, so I have included up to 17 rafter sections so rafter spacing is reduced to 18 inches for a 24 foot tent. Table 1. Spacing (Inches) Between Rafters for Internal Wall Tent Frames. Keep in mind, heavy snow can collapse any tent if not cleared off regularly. 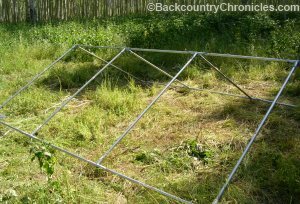 How Many 3 and 4-way Angles Do your need for your Wall Tent? This is simple, especially since all end rafters need three, 3-way angles for a total of six. On both ends, a 3-way angle is needed for the peak and one on each side where the roof meets the wall. Every wall tent needs 6, 3-way angles. Table 2. shows the number of 3 and 4-Way Angles needed for various number of rafter sections. All interior rafter sections need three, 4-way angles. So as shown in Table 2, if using three rafter section, that is two end rafters and only one internal rafter, so only 3, 4-way angles. If seven total rafter sections, that is five internal rafters, so 15, 4-way angles are needed. Table 2. Number of Angle Pieces and Rafter Sections needed for Various numbers of Rafters for Internal Wall Tent Frames. If you are considering getting a wall tent, also consider an internal frame. It sure makes it easy to set up camp when camping near the trail head. When using a wall tent instead of a camping trailer, it is much easier to get to those remote trail heads on bad roads. Obviously, if packing the wall tent into a roadless area with horses, the internal frame would be left behind. If you are planning to buy an angle kit, I hope this post helps makes it easier for you to decide on how many rafters you need and also don’t plan on too much shrinkage in the beginning. Outstanding! The most informative website I have found in the last 6 days of researching Wall Tents. The tables are extremely helpful, I printed them for later reference when I finally order my tent. Thank you very much and I look forward to reading more of your web site. I know you will enjoy camping in your wall tent. I’ve gone through the series on wall tents and they are a great read. Out of curiosity how did you come up with the figures for the amount of snow? I recently just purchased 12×14 (army duck) 4 rafter, thinking this would be more then sufficient but after reading this I’m slightly concerned. I haven’t read or seen anywhere where anyone is using more then 4 rafters in a 12×14. Is there math or is this just experience? Geoff: If you look up structural snow loads, you can find pdf and xls files that give snow loads for your area. These are calculated to meet building codes. In my area, my house needs to support up to 100 lbs/sq.ft. Houses at higher elevation need to support up to 231 lbs/sq.ft. Obviously a tent can be shaken or swept free when a roof can’t, but that is a lot of weight. But lets think about this another way. Consider that snow weighs 7 – 15 lbs per cubic foot. A 12 x 14 foot tent has a roof area that is larger than 12 X 14 because it is angled. But just to simplify, lets assume a roof area of 12 X 14 = 168 square feet. Six inches of snow could weigh 1,260 lbs (168 sq ft times (15 lbs per cu ft/2)). Your 14 foot wall tent has 4 rafters (same as one of mine), so each rafter would have to support a fourth of that weight (315 lbs per rafter; 157.5 lbs per side or per conduit). I tested my frame (1 inch conduit) by hanging on it (180 lbs), but I would not let 6 inches of snow build up on my wall tent if I had a choice. Every year, outfitters loose wall tents due to heavy snow if they have to leave one behind. Also consider that snow that slides off or was shaken off the roof should probably be moved away from the walls. I imagine that sideways pressure on a vertical support reduced the load that support can hold. A synthetic tarp will also allow snow to slide off easier. I live and play in an area that gets lots of snow. It is usually light, dry snow and I have been extremely lucky and never had more than just a dusting of snow on either of my wall tents. On years we’ve had big snows, they came before I was able to set up camp or after I broke camp. Thanks for the response, I’ll have to tear down and stash I guess. This poses another problem however which is mildew. It’s not unusual in my region (Atlantic Canada) to get heavy snow and freezing temperatures and then a day or 2 later be back above freezing. Any thoughts on something I can add to the bottom of a garbage bin that might absorb moisture and or prevent mildew? Mildew will be a problem if you can’t dry the wall tent before storing it and I can see drying a tent in your area could be a problem. Perhaps you could hang the tent in your garage for a few days. Desiccants (gels, pellets and powders) are used to keep everything between electronics and dry flies (fly fishing) dry, but I’m not sure how good a job desiccants would do on a wet tent that is folded up, especially in the amounts you would need (see types of desiccants). A small dehumidifier may be a better option (example of small dehumidifier). Thanks again, I was trying to figure out a way to leave the tent where it is being set up as apposed to bringing it home. Once home I’ve got the space. Although the majority of the travel is by vehicle there is still a 20ish minute hike (no animals / atv’s). So I guess I will tear down place in bin with desiccants and hope for the best. Wow… A 20 minute hike with wall tent and frame is a chore… But I bet it is a beautiful place and you don’t have to listen to your neighbors. I would love to see a pic when it’s all set up. How do you pack it all in? On your back? Game cart? Travois? (See my post on making a travois here). Also look for Adrienne’s comment and my response about making a travois for packing to camp. As for the mildew, remember mildew grows best in warm wet conditions… You will have a few days to get the tent dry before much mildew can get started if the temperature is cold. It is beautiful, its a untouched piece of land on a lake that’s undeveloped, I’ll see what I can do for pictures. As for how I pack in…well haven’t got there yet. The tent arrives Friday, so depending on weather and the fabrication of the frame goes I’m hoping to get there Saturday. I have an alps external frame pack so I’m guessing the tent/fly/floor will go in that. There will likely be 3 of us going one of which has a game cart, so I’ll be sure to tell him to bring that along. As for the rest of my gear, will have to make a send trip. May have to invest in a pulk if we still have enough snow. I will definitely take a look at the Travois article. Actually I do I do have a old and unused gt racer kicking around my property somewhere. Perhaps a modified Travois with removable ski’s. Anyway thanks again for your time, you’ve given me a lot to think about. If you have lots of snow, a “pulk” or an ice fishing sled may be an easier way to drag the tent than the game cart. I pulled out my last elk on ice fishing sled. Here is an example of ice fishing sled for folks that don’t know. I was not familiar with a GT racer. It may be a little top heavy for hauling heavy loads, but I’m sure you will figure out a way to modify it, but pulk or ice fishing/multi purpose sled is probably your best bet. But have fun and I look forward to seeing pics. If you can, send pics to email on Contact Page (bottom of page). Thanks.